Building on our coverage from West Virginia and Oklahoma, two Socialist Alternative (SA) members from Los Angeles drove to Phoenix to learn about and participate in the Arizona teachers’ six-day strike that yielded $400 million in additional education funding and created a movement that is just beginning to fight! 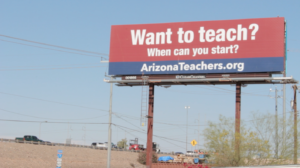 Enter Arizona Educators United (AEU), a grassroots organization of teachers and community supporters formed out of the need to improve the unacceptable conditions in Arizona public schools. This group emerged out of the success of the first Red For Ed “walk-in” on March 7 – inspired by the West Virginia teachers who had already begun their strike. The walk-in – a rally before school which ends with everyone walking into the school all together – was a show of solidarity among fed up teachers, students, parents, and other community members. AEU took the lead as walk-ins were organized online and quickly spread throughout the state’s school districts building the confidence of teachers and spreading awareness throughout the school and wider community. On March 28, Red For Ed held a rally of thousands at the state capitol in its first public show of strength. AEU grew to upwards of 40,000 members. On April 5, AEU and the Arizona Education Association (AEA), the main teachers union in the state, announced the formation of a negotiation team, sending Governor Ducey a letter containing RedForEd’s demands: 20% salary increase for teachers; restore $1 billion in funding to pre-recession levels; competitive pay for all education support staff; a permanent step and lane salary structure that would guarantee annual raises; and lastly no new tax cuts made until Arizona’s per-pupil spending of $7,489 reaches the national average of $11,392. Walk-ins continued to grow from weekly to daily. As the walk-ins gained steam, Ducey offered a 2% pay increase amounting to $65 million. This was rejected and a 78% strike authorization vote set the stage for an historic walkout. With a looming teachers’ strike planned for April 26, Governor Ducey then pledged to provide teachers with a 20% raise by 2020, to include 10% this year, followed by 5% each of the next two years. The other demands were brushed aside as Ducey cynically asserted that the real issue here was just teachers clamoring for a raise. Deeply unsatisfied with the governor’s proposal, the teachers walked out as planned. In an unprecedented show of people power, some 75,000 teachers and supporters took to the streets around the capitol in a sea of red. 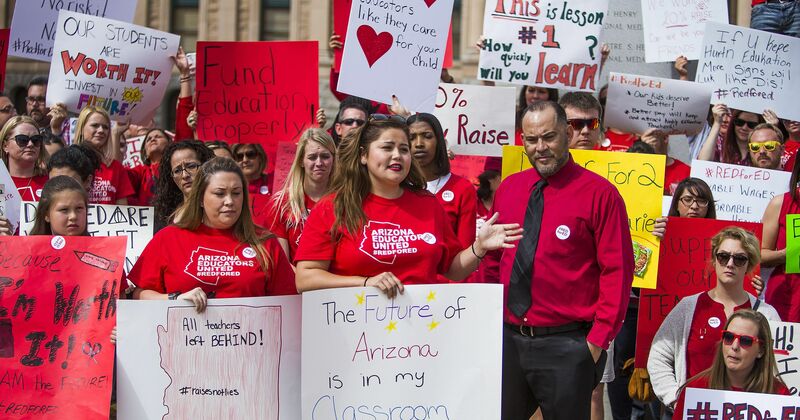 The AEA union only represents about one-third of teachers in Arizona, and the massive turnout was a reflection of the broad desire to fight against austerity and to strengthen public education. The pressure campaign on Ducey and the Republican-controlled legislature had reached a new level. The walkout continued on Friday and day three of the strike resumed on Monday. By mid-morning, SA reporters arrived at the Arizona State Capitol to witness thousands of energized, red-clad teachers. There were canopies and camping chairs everywhere, with posters taped up identifying districts and individual schools. There were long lines to get a seat inside the statehouse to watch the proceedings. As SA entered the capitol courtyard, a teacher approached us with a petition for the Invest in Education ballot initiative. The petition was launched on the previous Friday by the Arizona Center for Economic Progress. The teacher explained that the initiative “would tax the wealthy.” When we asked if the idea was popular among the demonstrators, the teacher replied that “people have been signing up nonstop all morning.” As we made our way through the courtyard, we could see that the signature drive had spread throughout the teacher encampments. Far from any resistance or mistrust, taxing earners who make over $250,000 was resonating in the form of pages and pages of signatures. Meanwhile, details of the K-12 education funding bill began to spread through the encampments. The bill disregarded four of the five teachers’ demands. Several other problems emerged in the bill put forward by Ducey’s legislative allies as it narrowly defined teachers so that only general education teachers would see the pay increase – a tactic designed to divide workers and leave whole sections of the education workforce frozen out. Furthermore, it became clear that funding the proposed pay hike amounted to a cruel shell game that would take money from other programs like Medicaid, the arts, and students with disabilities. Teachers waited in line all day in the sun and continued well into the evening to give testimony against the proposed K-12 bill. Then, as night had fallen over the capitol, AEA president Joe Thomas and AEU leader Noah Karvelis held an unannounced press conference, stating that the strike would end and that teachers would return to their classrooms on Thursday pending the legislature’s passing of the bill. Responding to a question at the press conference, Karvelis stated, “this legislature is only going to go so far. Not as far as they are able to go, but as far as they are willing to go. That realization is crystal clear.” With the legislature set for a lengthy recess, the strike leadership made a calculation to demobilize without gauging the mood of the demonstrators. This decision was met with a mixture of confusion, disappointment, and relief. The movement rebounded from the previous night’s confusion and energized the striking teachers to pressure the legislature to pass the flawed K-12 bill as it would still mean a significant victory. Teachers once again flooded the capitol grounds on Wednesday morning with more chants and music. At 2pm, an announcement rang out over megaphones: the legislature would go into recess for six hours. Democratic representatives supportive of the teachers movement, such as gubernatorial candidate Rep. Steve Farley, took the opportunity to add amendments to the spending bill such as lowering class sizes and closing corporate tax loopholes. However there were worries that the Republicans were stalling. After Tuesday night’s announcement, school districts had already begun telling parents and students that schools would be opening on Thursday. According to a leak from a legislative aide, Republican lawmakers indeed began stalling the budget proceedings in the hopes that public pressure would force the protesters to be back in schools on Thursday so they could pass a budget on Friday or Saturday that included only a 5% pay increase. This maneuver backfired as thousands of teachers responded to the call to camp out and stayed all night. The galleries of both houses of the legislature remained packed into the early morning. Teachers in the gallery looked on in anger as Republican lawmakers played games like solitaire on their cellphones and dragged out the debate over the spending bill. Several teachers said that they were frustrated by the blind partisanship, as Republicans did not seem to seriously consider the amendments. Teachers saw first hand the limits of electoral politics, as the pro-education amendments were voted down, and Republican representatives continued to be openly hostile toward the teachers, many of whom had voted for them. The K-12 funding bill was passed, then signed by Governor Ducey, at 5am on Thursday morning after all-night legislative sessions that included Red For Ed-packed galleries in the senate and house chambers. The K-12 bill includes a 20% pay increase that will increase education funding by $400 million – a massive difference from the meager $65 million first offered by Ducey. The strike leadership and the teachers are well aware of the bill’s flaws: the bill is funded by an increase in vehicle registration fees – a regressive tax that places the burden, once again, on working people, while corporations continue to make massive profits – and the money will be placed in general funds on a district-by-district basis to be doled out by school boards rather than placed directly in teachers’ paychecks. But this accounts for a significant funding increase and a major confidence boost for Red For Ed moving forward! Many teachers were further motivated to keep the movement alive beyond the spending bill fight upon learning about how the legislature still found $500,000 in this session for so called “freedom schools,” libertarian think tanks backed by the Koch brothers located at Arizona State and Northern Arizona universities that get millions in handouts from the state government. Furthermore, learning how the charter system uses public funding for private gain gave the teachers another injustice that they swore to rectify in the future. A chant often heard at the capitol was, “In November we’ll remember!” reflecting a strong desire to vote in pro-education representatives, especially to replace the Republicans who were often openly hostile and attempted to paint the teachers as lazy, greedy, or as communists indoctrinating the youth. AEU co-founder Noah Karvelis told us “We need candidates who believe in public schools. We need candidates who will prioritize students over corporations.” There are indeed many Democrats running on a pro-education platform for the statehouse, including some teachers. Some are undoubtedly genuine. But the Democrats as a whole are a corporate party which went along with many of the tax cuts for big business while cutting education. Former Democratic Arizona governor Janet Napolitano did precisely this ten years ago. Even if the Democrats take control of the statehouse Red For ED will have to remain vigilant to hold them accountable to the demands of the movement. Teachers will have to be prepared to march and strike against them as well if necessary. As far as immediate goals, Karvelis insisted, “I think the clear answer now is the Invest in Education Act [ballot initiative]. The resulting revenue would fund education directly and is projected to garner around $700 million annually.” This ballot initiative campaign gives Red For Ed a concrete vehicle with which to carry the momentum of the strike forward through the summer months and into the next school year. From West Virginia to Oklahoma, Kentucky to Arizona, teachers in traditionally conservative states are rising up. Could we be seeing a revitalization of the labor movement? In most of these states, except West Virginia, the teachers were trying to create a tradition of struggle largely starting from scratch. The teachers have displayed incredible solidarity and won truly impressive gains but it is only a beginning. It will take more grassroots, rank-and-file organizing within unions to properly fund education in these states, and beat back right-to-work laws and other attacks on the rights of working people. If the teacher strike phenomenon is to continue, and perhaps revitalize the labor movement, a fighting leadership that draws upon the lessons of militant labor history will be crucial. But this process is vitally underway, teachers are on the move!